When a cell periodically tests its external environment, a mechanical signal is converted to a chemical signal across the cell membrane. Adhesion receptors located on the external cell membrane bind to surface molecules (extracellular membrane (ECM) components or other cells). 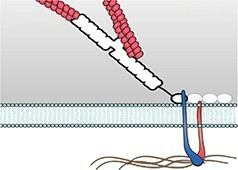 The strength of this adhesion is converted to force-induced conformations within mechanosensory molecules. These molecules are linked to a network of cytoskeletal filaments, through which the force can be transmitted. 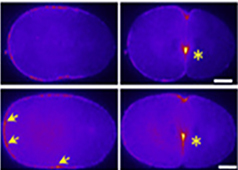 Initial mechanosensing is rapid, within a sub-second to second timescale, leading to an early mechanoresponse that occurs within seconds to minutes. 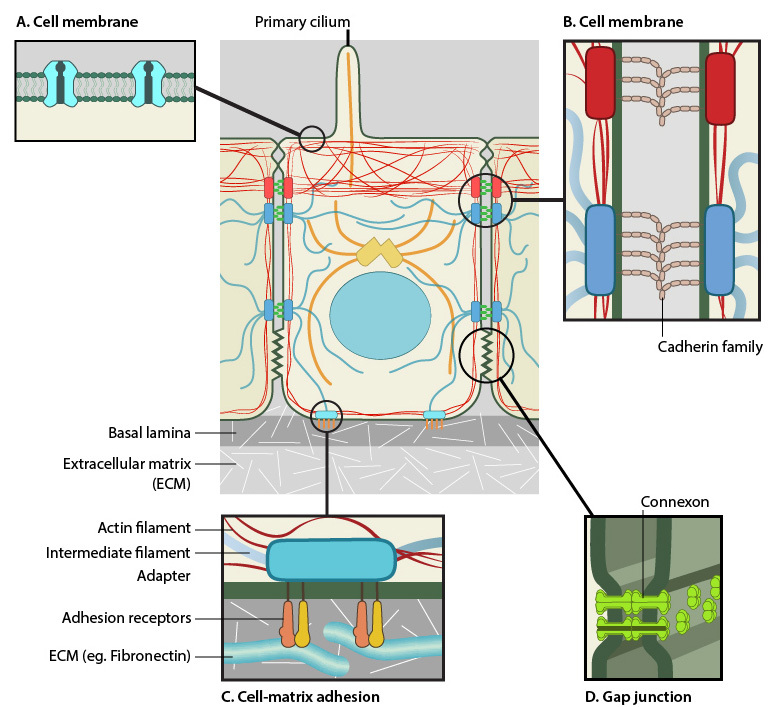 Mechanical sensing of the environment can take place via membrane receptors (A), focal adhesions to the ECM (B), and also via cell-cell adhesions such as adherens junctions (C) and gap junctions (D). The strength of the initial mechanosensing event (e.g. 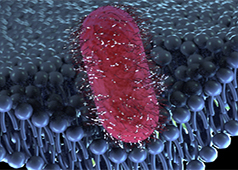 the amount of force sensed at the cell membrane) stimulates a feedback system within the linked cytoskeletal network. 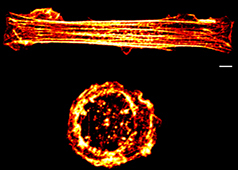 Following the initial response, a cell generates more forces between the contractile filaments, proteins that link the ECM to the cytoskeleton and the cell membrane. 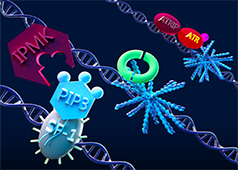 The mechanosensitive sites along these filaments can promote a second wave of responses. 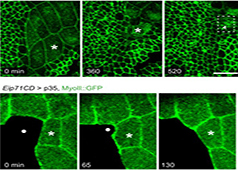 For example, force-induced membrane tension, compliance or curvature can influence mechanosensors at the cell surface, leading to further focal adhesion assembly , cytoskeleton redistribution , cell movement , and ECM remodeling ,. There are two types of mechanosensing; active and passive. Passive mechanosensing is also known as ‘outside-in’ mechanosensing, as it is defined by external forces being detected and transduced into the cell (as reviewed in ). These forces include tension, compression, shear stress and hydrostatic pressure. 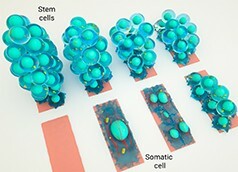 Conversely, active mechanosensing is known as ‘inside-out’ mechanosensing and is defined by internal forces being generated by the cell to detect changes in the external environment. 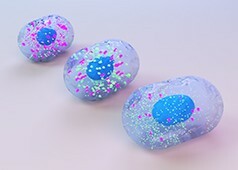 A common example is the generation of cellular traction as means to survey the external environment. Passive mechanosensing can be exemplified by the detection of fluid shear stress by endothelial cells, via a mechanosensory membrane protein complex that bridges the extracellular and intracellular environments . 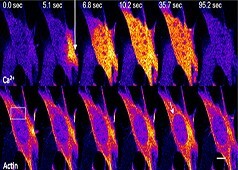 Another example is that of intraluminal pressure detection by arterial myocytes, via receptor-ion channel complexes . 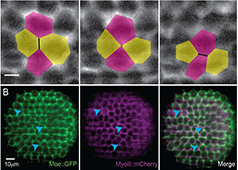 Active mechanosensing can be exemplified by force generation to promote cell movement from soft substrates to stiffer substrates, in a process termed durotaxis  and in the detection of surface topology . The generation of forces needed for cell migration, namely traction, involves coordinated activity between focal adhesions and retrograde F-actin flow . 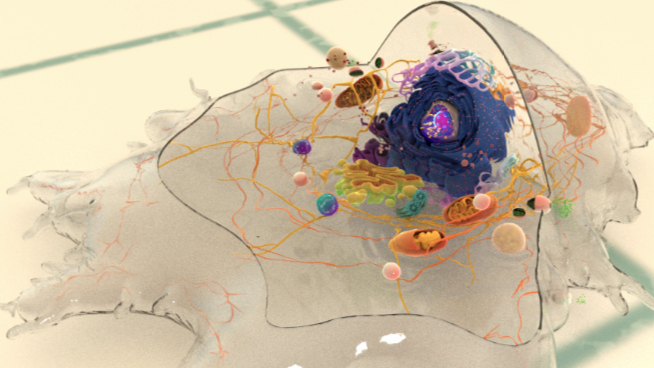 Mechanosensing, whether active or passive, leads to intracellular responses that are transduced through the cell and ultimately result in a context-specific response.